LOS ANGELES, CA – (Wednesday, January 23, 2019) – Pixies – Joey Santiago/guitars, Black Francis/vocals, guitars, David Lovering/drums, and Paz Lenchantin/bass, vocals – are excited and proud to announce a brand-new Pixies album due out this September. Produced by Tom Dalgety, (Ghost, Royal Blood, Pixies’ 2016 album Head Carrier), the as yet untitled album was written over the course of 2018 and recorded in December at Dreamland Recordings near Woodstock, NY. This will be the group’s second album as a unit, and the eighth overall Pixies studio recording. Historically, Pixies have not let much light in on their creative process, but with this album, they definitely pulled back the curtain. Pixies and Signal Co. No1, the New York-based podcast company that focuses on music culture, have collaborated to give fans a unique, up-close-and-personal look at every aspect of the recording process and the band’s studio experience. 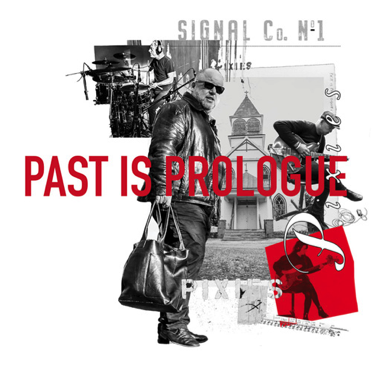 Starting June 27, a 12-episode weekly audio podcast, “Past is Prologue, Pixies,” will debut with a new installment each week leading up to the album’s release. Hosted and narrated by New York Times best-selling author Tony Fletcher, the series will be available globally on these podcast platforms: Apple, Spotify, Acast, Stitcher, Google, and more. Today, an audio and video trailer for the podcast series is released and can be viewed HERE. A brand new trailer will be available each subsequent month (February – May) in advance of the podcast debut. For the “Past is Prologue, Pixies” podcast, Signal Co. No1 recorded every moment of the creative process, both in the studio’s control room, the main room, and in a special “video booth” where the band members documented their thoughts and observations over the course of recording. Every episode will document the band’s new music, from its earliest stages through to completion, giving fans the opportunity to witness the evolution of the tracks. Additionally, Fletcher spent copious amounts of time with the band at the studio, soaking up the entire process and conducting interviews with every band member as well as with Dalgety. Prior to the new album’s September release, Pixies will head out on the road with Weezer for a five-week arena tour that will include several Pixies headline shows. Dates are below.